"Reports of my death are greatly exaggerated,” Mark Twain was famously quoted (or misquoted) to have said. Now, it seems, the same could be said of the Jaguar XF Sportbrake. Just yesterday we brought you a report indicating that the British automaker was preparing to withdraw its mid-size wagon from the North American market. But a spokesperson for the automaker now assures us that's not the case. 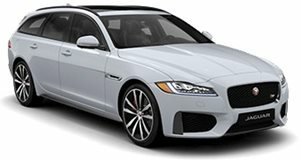 "The current Jaguar XF Sportbrake remains in the lineup and is available at retailers and for ordering,” Jaguar's Maria Rodriguez informed CarBuzz by correspondence. The Sportbrake variant, we're told, accounts for 20 percent of XF sales. By our estimate, that would amount to 462 wagons (out of a total 2,308 XFs) sold in the United States in 2018. By way of comparison, Jaguar reported having sold 14,752 examples of the similarly sized (but taller) F-Pace crossover in-market last year. Despite the small niche it occupies, however, the automaker asserts that the XF Sportbrake will remain available (for the time being, at least). "This should be good news for wagon enthusiasts,” Rodriguez enthused. It should indeed, particularly against the backdrop of other wagons being discontinued or withdrawn from US showrooms. Recent years have witnessed the demise of the Cadillac CTS Sport Wagon, Acura TSX Sport Wagon, Lexus IS SportCross, and Volkswagen Passat Wagon (to name just a few). The major German marques have dwindled their wagon lineups to one model each: the Audi A4 Allroad, BMW 3 Series Sports Wagon, Mercedes-Benz E-Class Wagon, Porsche Panamera Sport Turismo, and VW Golf SportWagen. Volvo offers both the V60 and V90 wagons, Buick the Regal TourX, Mini the Clubman, and Subaru the Legacy-based Outback. Add to those the Jaguar XF Sportbrake, and the wagon segment doesn't look quite so dead or dying after all.